Nearly three decades later, Iran is one of the few nations without an organ shortage — every Iranian who needs a kidney can receive one. Should other nations follow suit? In 2014, 4,761 Americans died waiting for a kidney transplant. In 2016, legally donated organs met less than 10 percent of global need, according to a report from ONT-WHO Global Observatory on Donation and Transplantation, the world’s most comprehensive source on transplant-related data. In 2014, 4,761 Americans died waiting for a kidney transplant, and another 3,668 dropped off the list because they became too sick to receive one, notes the National Kidney Foundation (NKF), an organization dedicated to the awareness, prevention, and treatment of kidney disease. Given this substantial need, perhaps it’s not a surprise that people turn to the black market to save their lives. 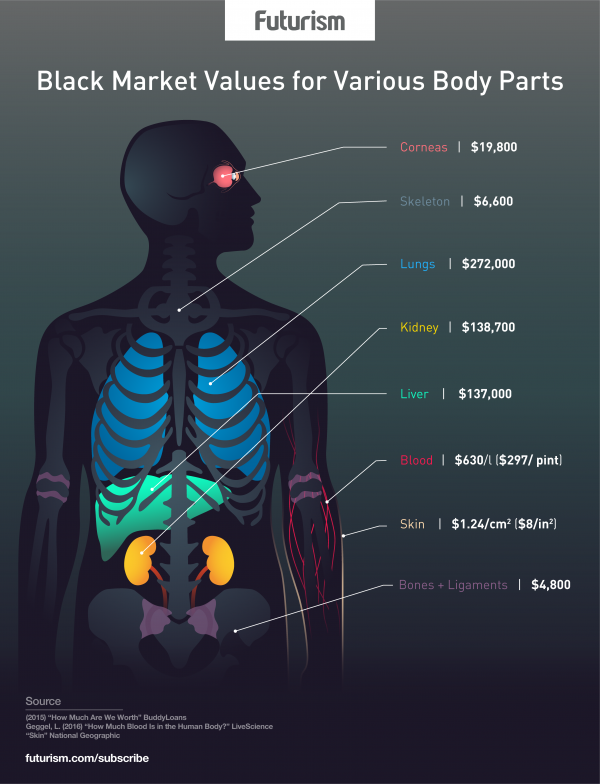 While exact figures are hard to come by (the black market doesn’t exactly have any official ways to track it), the illegal trade of all organs generates between US$840 million and $1.7 billion annually and accounts for an estimated 10 percent of transplanted organs, according to a 2017 report from Global Financial Integrity (GFI), a non-profit research and advisory organization focused on illicit financial flows. Kidneys are the most-frequently sold organs for a fairly simple reason: humans have two and can live a healthy life with just one. Selling kidneys, then, might seem like a simple matter of supply and demand — the demand for kidneys is high, so willing donors should, in theory, be able to negotiate their price from a position of strength. However, the population supplying the organs is nothing like the people receiving them. GFI researchers found that kidney buyers are usually middle- to high-income individuals from developed countries, while kidney sellers are typically from the world’s most vulnerable populations. For poor and uneducated citizens of developing countries, selling a kidney may seem like the only way to escape poverty or settle a debt. Recipients may pay upwards of $200,000 for a kidney, but the donor may receive as little as $5,000 of that (a broker pockets the rest), according to the WHO. Some donors aren’t paid at all, and because the sale is illegal, they have little recourse to obtain the money they are owed. Even worse, inadequately trained surgeons may perform the surgeries under unhygienic conditions. Donors may be left with dangerous, painful complications that could force them to miss work or require expensive follow-up care, leaving the donor in a more financially precarious situation than prior to selling his or her organ. By legalizing the sale of kidneys from living donors, Iran has been able to avoid these pitfalls of a black market, and today, about 55 percent of all kidneys donated in the nation are from living donors, according to government statistics obtained by the Associated Press. For comparison, only about 38 percent of kidney donations in the U.S. are from living donors. The rest come from deceased donors, and those organs aren’t as likely to keep recipients healthy in the long term. The process of buying or selling a kidney in Iran is fairly straightforward, a 2011 paper shows. A doctor writes a letter stating that a patient needs a kidney, and the patient then brings that letter to an office of the Kidney Foundation of Iran, a nonprofit organization that facilitates the nation’s kidney transplants. The organization adds the patient to a list and sorts by his or her blood type. Patients in the midst of a medical emergency and disabled soldiers are placed higher up on the list, according to the paper. To be approved as a living donor, interested Iranians go to one of the foundation’s offices to undergo medical testing (the donor pays for the tests). If the foundation believes the kidneys are healthy enough for transplantation, they approve the donor. Next, the foundation will contact the person nearest the top of the list for that donor’s blood type, taking into consideration other factors such as the donor’s physical build — a particularly small kidney might go to a child or female patient even if they are listed below average-sized men because a closer match between the size of a donated kidney and a recipient’s original kidneys results in a better long-term outcome. The Iranian government pays for the transplant surgery itself as well as one year of health coverage for the donor after the surgery. The recipient (or their family) pays the donor, using the foundation as an intermediary, Farshad Fatemi, a micro-economist at Sharif University of Technology and author of the 2011 paper, told Futurism. The base price is set at $4,600, but if the donor isn’t willing to sell their kidney for that price, they and the recipient can privately negotiate a higher amount shortly after a match is set up. In 2011, Fatemi estimated that organ recipients will sometimes pay an extra $530 to $1,060 on average. If the donor and recipient agree on terms, both undergo tissue testing to make sure the recipient would be unlikely to reject the new kidney. If the results are favorable, the patient and donor sign an agreement and are given a list of centers and doctors that can perform the transplant. The center will hold the check from the recipient during the surgery and hand it over to the donor afterward to ensure payment is made. While the Iranian system does speed up the process of organ donation for patients — the average wait between reaching out to the foundation and receiving a kidney is five months — Fatemi said the legal kidney market is not without its shortcomings. One issue is that doctors often fail to follow up with donors post-surgery. It’s important to follow donors for several decades after donation to see how the process affects them, Fatemi stressed, but said doing so would be difficult, as donors often try to hide their identity to avoid the stigma associated with selling a kidney. Educating the public on the benefits of donation, paid or not, could help solve this problem, Fatemi said. Fatemi also noted that, just like the illegal kidney market, the poorest, more vulnerable members of society are still the ones donating in Iran’s legal market, and they typically only do so because they feel they have no other option to escape poverty. “I have been to the foundation. The people who are donating are young and full of energy, but they are poor and selling a part of their body to solve what may amount to very small problems in their everyday lives,” Fatemi said. Given the lack of follow-up, no one even knows for sure if these vulnerable citizens benefit from the sale. Though Iran’s market may be imperfect and only stops the illegal sale of one type of organ, Fatemi believes it’s better than the alternative of having a black market. The system protects disadvantaged donors by ensuring they are paid what they are owed and taken care of medically, and it also gives recipients a second chance at life that they may not get otherwise. For now, Iran still stands alone in allowing citizens to legally sell their kidneys, and no other nation appears on the cusp of doing so. However, that’s not to say a new legal kidney market couldn’t emerge. A 2015 study published in the journal American Economic Review concluded that U.S. citizens were more open to the idea of organ sales when presented with information on their potential benefits, so at least one barrier to creating such a market — public disapproval — could potentially be eliminated through education programs. Still, Iran didn’t decide to legalize kidney sales until the situation was dire, so if history is any indicator, the next nation to test a system will likely be one facing a similar situation, perhaps somewhere like India where end-stage renal disease is becoming more common and the black market is thriving. Meanwhile, nations where the frequency of end-stage renal disease has stabilized over the last decade, such as the U.S., may choose to continue with the status quo until new technologies and treatments render the kidney market, both legal and illegal, obsolete. “Every time I go to the foundation, I wish for the day when we can clone a kidney for a person,” said Fatemi. Until that happens, he said, Iran’s system is a good one.